Niall wasn’t alone in being awestruck by the Katana’s love-it-or-loathe-it styling when it debuted in late 1981, but being several years shy of being able to ride even a 50cc bike on the road, there wasn’t much he could do about it at the time. The desire to own a Kat lay dormant in a corner of Niall’s mind until two and a half years ago when he found a modified GSX1100SD for sale. The owner had just finished building it – he hadn’t even MoT’d or ridden it, but he was forced to sell it. With GSX-R suspension, custom paint (albeit with the Katana logo erroneously turned through 90 degrees, much to Niall’s constant annoyance) and unique cosmetics, it’s become such a treasured and enjoyed machine he sold off his other two bikes. But as good as it is, it’s not the bike he coveted as a schoolboy. The desire to own a standard Kat evidently still niggled at him. A rough, poor-running but complete 1981 GSX1100SZ was spotted on eBay for £1000 just as the listing appeared on a Sunday evening. Initially, a purchase was forbidden by Niall’s ZX-6R-riding other half, Hazel. So Niall borrowed a van from his accommodating employers at the Hyundai car dealership he works at, and rushed over to Doncaster to view the bike. The Katana was worth the cash – uncharacteristically for a proud Yorkshireman, he didn’t haggle, and handed over the asking price. Although the description of ‘running’ equated to a stab of the starter button, a handful of combustion-fired revolutions before cutting out a split second or two later. Unloaded at home using the pilfered plank, Niall swapped the carbs from his running special over to the new purchase to try his luck getting it to run properly. It fired up instantly, although the special’s jetting was wildly rich for the stock 16-valve motor, and it threw flames out of the aftermarket exhaust. The rest of the bike was in a shabby, but not irretrievably neglected state. Under the decidedly 1980s purple/black paintjob, his new project was original bar the exhaust, Micron fork brace and a missing centrestand. Good news for the self-confessed northern penny-pincher, as getting the Katana back to the standard he wanted would come down more to elbow grease than spending cash buying new parts. But it still needed money spent, so Niall formulated a plan to build the bike in such a way that it could be progressed as and when disposable income became available. Niall started by stripping the bike back to its frame. The initial strip took just two hours – the forks and rear suspension assemblies came out in big chunks to start with, before being divvied up in to smaller assemblies. Niall reports that there were no issues with seized or stripped fasteners. The dismembered Katana was then further categorised – parts for plating, parts for powdercoat, parts for paint and components in need of Niall’s attention. The first allocation of cash to the Katana fund went on powdercoating by LSN Coatings in Castleford. Frame, swingarm, calipers, chainguard, battery tray, fairing brackets, screen supports and numerous other little fittings were blasted and coated, mostly in black. The frame and swingarm were due to get a silver treatment. They got it – but instead of the standard flat silver colour sported by the original bike, there had been a mix-up and the frame now had a metallic finish. Not as it left the Suzuki factory, but Niall decided that he liked it anyway, so he left it as it was. Next to prise cash from Niall’s wallet was a rechrome for the airbox cover, the dismantled shocks, the cam end caps, the swingarm spindle and the gear lever. The brake lever is also chrome, but Niall cleaned the minimal pitting and corrosion off at home, saving a few quid. The initial spend allowed Niall to start some reassembly. Yokes, swingarm and forks were refitted. The stanchions were pitted beyond repair, but Niall bought a secondhand set with the intention of getting those rechromed, but not until a little later when finances permitted. In the meantime, the originals were used to allow the bike to stand on its wheels. Niall cleaned the wheels up himself and rebuilt the powdercoated caliper bodies with new seals and cleaned-up original pistons. The stock hoses were kept, but the original mastercylinder was shot. 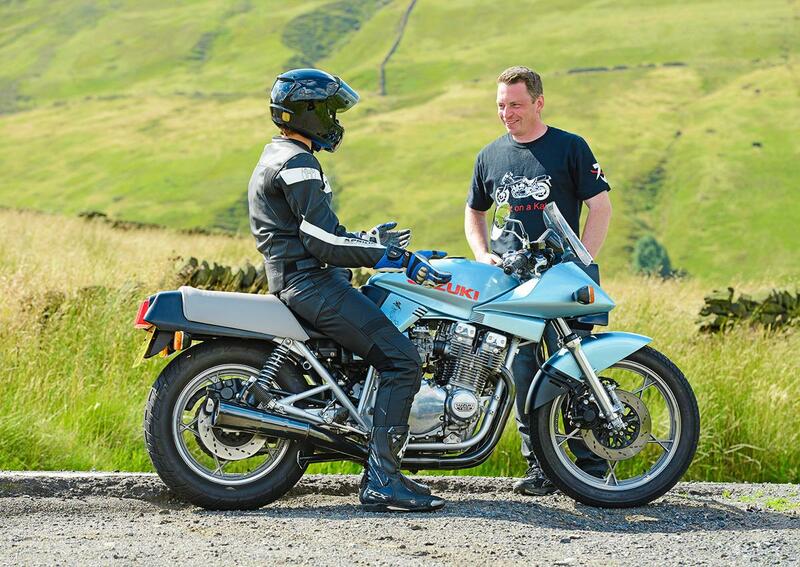 A rebuild kit would have set Niall back £50, but he read of another owner who fitted a GPZ900R mastercylinder, which gave a small improvement in peformance. He found a functioning but cosmetically poor GPZ setup for £25, and has fitted that instead. 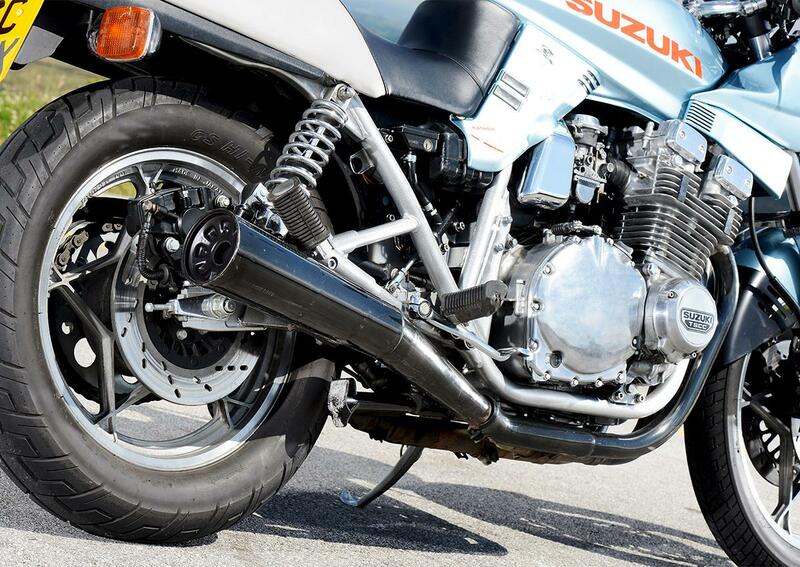 Initially he considered a period-style, lightly modded look retaining the 4-1 pipe, but the generous offer of a set of good condition standard GSX1100EFE exhaust pipes persuaded him otherwise. The silencers are 10cm or so shorter than Katana ones and require modification of the brackets to bolt up correctly, but are a cost-effective alternative to stratospherically priced Kat ones. The span-adjustable brake lever is from a later Kawasaki, and Niall has also fitted a clutch lever bracket from a ’90s Kawasaki to give a matching adjustable cable-operated clutch on the left handlebar. The bars themselves aren’t standard either – they’re a set of period Telefix adjustable clip-ons that came with the bike. Niall opted to leave them, along with the Micron fork brace to preserve a bit of the bike’s history. The original rear shocks were given a good clean and then painted – twice, in fact. A supposedly tough paint flaked straight off. A second coat proved more hardy, so Niall refitted the rechromed springs and fittings. Niall decided not to get involved in a costly engine rebuild, given that it ran fine when tested with another set of carbs. His aversion to paying for the work of others came into play again, as Niall chose to strip the non-standard engine paint off himself with a tin of Nitromors and a brass brush in the garage. He managed to escape serious injury, but the crankcase joining bolts fell victim to the stripping chemicals, so Niall had to split the cases and send the bolts off for replating. Niall managed to do it without breaking the whole engine down – he inverted the engine and removed the bottom crankcase half. Apart from setting the tappets and cleaning the sump gauze, the running 16-valve lump was left alone. Refitting the cleaned and serviced motor definitely isn’t a one-man, or indeed one-woman job, though Niall did manage to remove it himself in the first place. His home’s plumbing was raided for foam lagging strips to protect the frame, and with the help of partner Hazel, the engine was lifted in without so much as one chip in the powdercoat and secured in place. Next, the carburettors were cracked open for cleaning, where Niall found horrendous thick build-ups of congealed fuel. “How petrol turns into that I don’t know, but I had to leave them soaked in carb cleaner for days just to get the float valves free from their brass seats. That it ran at all, even briefly, was a miracle. I distorted the float seats taking them out because they were so difficult to remove. With the end of the build nearing, Niall sent his spare forks for a rechrome by AM Philpots before rebuilding them. The unique colour was inspired by an Australian Kat in a similar light blue hue Niall saw online. The particular colour he chose is Ice Blue, a colour used on the (deep breath now) Subaru Impreza WRX STI WR1 (which is a car by the way, not a digital camera). He chose to have the seat recovered in vinyl instead of the original suede-effect. One last detail was the engine side-cover badges, supplied again by B&B Motorcycles, Niall’s favoured genuine Katana parts source. The ‘Suzuki TSCC’ decals make a big difference, and they’re one of a surprising number of OE bits still available new. Apart from the small issues with the float seats, the restored Katana has covered 1000 trouble-free miles. Niall says: “To be honest, it doesn’t ride as well as my modified bike, but that wasn’t the point. I still enjoy riding it, though you can tell its age from the riding position, and oddly it handles better with a pillion on the back.”Hmm, perhaps – but we’ll have a solo ride, thanks. Keys please, Niall. 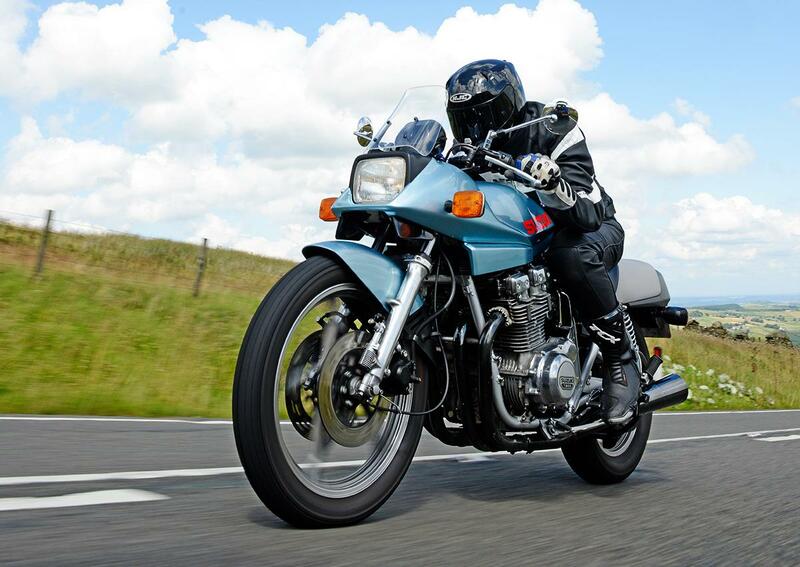 I’m looking forward to sampling another of Suzuki’s air-cooled lumps – the last one I rode was an EFE which, despite having a chassis in dire need of a full overhaul, planted a whopping smile on my face thanks to the motor. Now, the Kat’s a little less pokey than the 1150EFE, but it’s also a smaller bike, so it’ll still be fun. The Katana is as unusual to sit on as it is to look at. Even with the adjustable bars, it’s a long reach over the slim tank from the low seat. Niall warns me the standard footpegs are cramped – when in leathers he can’t even bend his legs onto them – and I soon encounter the problem. With an age advantage on my side, I can just about get my leather-clad legs up. It’s not dissimilar to a later GSX-R1100 or even a Hayabusa. The Kat’s dragstrip-hero lineage is evident but in no way comfortable. Still, if I wanted comfort I’d get a job testing Nissan Micras, so I man up and get on with it. The motor has a unique character at low revs – smooth, strong drive with the distinct rustling noise you only hear with standard exhausts in place. Suzuki have always done a slick gearbox, and the Katana is no exception. It’s a little less slick than some newer models, but that’s progress. The GSX motor still selects each gear cleanly and securely. The grunt is the attraction of these bikes. From down low in the rev range up to around 7000rpm, there’s smooth and strong torque when you want it. It’ll go on to 9000rpm, but you’re better off short shifting with an engine in standard tune rather than letting the power tail off. It only ever needs five gears which is lucky, as that’s all it’s got. You only really need to drop down the gearbox when it comes to very slow bends. The Kat comes from a period when handling was still behind the power and weight figures of the era’s superbikes. It’d be another year or so before manufacturers built a chassis that felt like it could handle the Katana’s claimed 100bhp-plus. So corners are interesting. At 75 per cent effort, the Katana is OK with high-speed sweepers as long as they’re not too bumpy. Put in any more effort, find some rough tarmac or try to hustle around slow bends, and you’ll find the limits of ’80s suspension, long wheelbase and a lot of weight. Occasionally, the Kat gets wobbly. When it does, you just have to hold on, make no change to your input and let it work itself out. It’s entertaining in a way, but you wouldn’t want to make a habit of provoking it. Braking is poor though, even by standards of the time. Different pads might help, it’s running what came in the bike. But Niall didn’t build it to thrash. Ease up, enjoy the motor and it’s a nice place to be, with that pleasing feeling of riding something special and a little bit out of the ordinary. Sometimes pride in ownership is worth more than a bike’s outright ability. And Niall’s got a lot to be proud of in his Katana.